According to the research report by Transparency Market Research (TMR), the global pharmacy repackaging systems market is estimated to expand at a steady CAGR of 7.8% within the forecast period from 2016 to 2024. In 2015, the market was worth US$997.1 mn, which is expected to reach around worth of US$1.8 bn by the end of 2024. 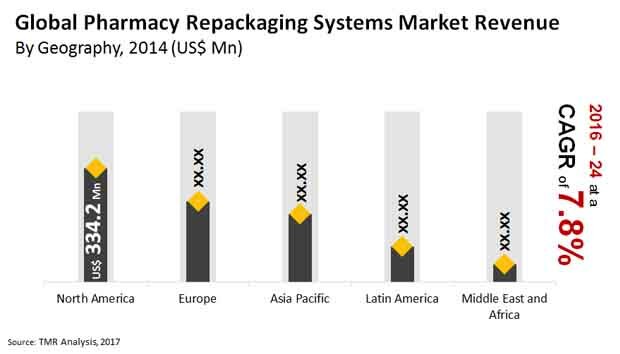 The pharmacy repackaging systems market is categorized based on product into pouch packaging automation systems, liquid medication packaging systems, blister card/compliance packaging systems, bottle filling/ pill counting automation systems, and so on. Among these, the blister card/compliance packaging systems segment is anticipated to lead the global market in the forthcoming years. Geographically, Europe and North America market is expected to dominate the global market owing to the development in healthcare. The firms are now concentrating on the research activities of the medications by getting inclined towards pharmacy automation systems including repackaging systems. The increasing cases of erroneous deaths because of the improper administration of the medicines and drugs is foreseen to propel growth of the global pharmacy repackaging systems market. The market is additionally profiting by the stringent controls in various healthcare centers, hospitals and drug stores that need the reduction in such blunders, fatalities, and expenses because of poor administration of dosages. Developing emphasis on understanding wellbeing has surged the interest for smart innovations that have been developed and created to prevent medical errors. The developing awareness relating to the proficient administration of stock with automation technology is additionally anticipated to give the global market a jolt in the coming years. Be that as it may, the soaring expense of implementation of pharmacy repackaging framework is likely to be a key factor in charge of limiting the development of the global market during tenure of 2016 and 2024. Moreover, absence of awareness about the potential advantages these computerized systems can offer in a few regions markets has been a critical inhibitor as well in the global market. This controlling factors have emerged in developing nations of the world, where medicinal services establishments are affordable and less knowledgeable investment, around one-time investment that can be receive rewards for quite a while. The increasing cases of erroneous deaths because of the improper administration of the medicines and drugs is foreseen to propel growth of the global pharmacy repackaging systems market. Developing emphasis on understanding wellbeing has surged the interest for smart innovations that have been developed and created to prevent medical errors.